For weeks now, people said it was premature to use the P-word. The Bucs hadn't played well enough. It was an unrealistic standard. But it all came to life Sunday. The crowd felt it. 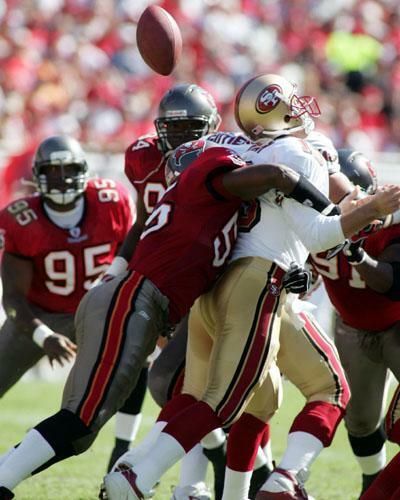 So did the San Francisco 49ers, usually with a thud. The P-word. Pride. Defensive pride. Playoffs? Yes, it's definitely too early for that other P-word. But apparently, it's not too late for the Bucs to rely on their long-standing identity. Were it not for 83 yards on San Francisco's final desperate drive, the Bucs would have registered one of the franchise's all-time defensive beat-downs. Even so, the Bucs allowed just 197 total yards in a 35-3 blasting of the 49ers. 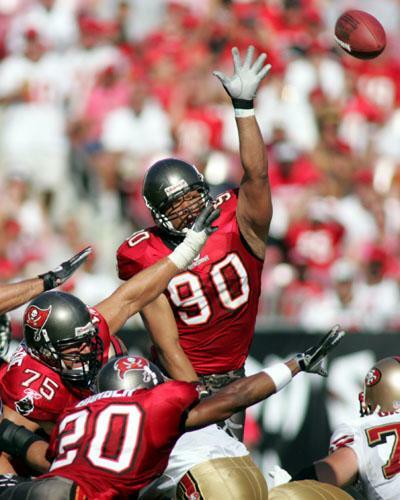 ``When I walked into the locker room, the first thing I said was, `Those are the Bucs I know; those are the Bucs I remember,' '' said Chidi Ahanotu, who recently returned to Tampa Bay after spending 1993-2000 with the team. Let's also state the obvious. The 49ers (1-9) are awful, maybe the NFL's worst team. But the Bucs (4-6) did what was necessary. They suffocated San Francisco's offense with teamwork and professionalism. The 49ers never had a chance. That's what you do against sinking teams. You step on them. Once, that happened nearly every week. Against the Bucs defense, especially on their home field, making first downs was dogged work. Nobody trampled into Tampa Bay's end zone with regularity. It was a tradition, a swaggering style that became the franchise's trademark. And it can happen again. Really, it felt like old times. It's definitely the sensation Buc defenders want to experience more often. And maybe they will. After all, it's a tradition.